FeiyuTech’s after-sales policy is applied to FeiyuTech products sold on regulated channels. 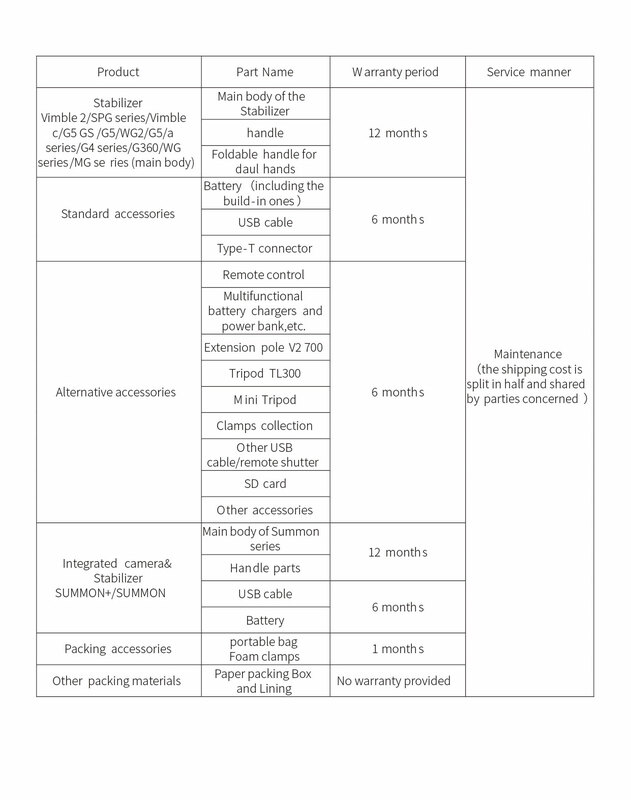 Products that meet the after-sales standard can be returned without reason within 7 calendar days from the receiving date in mainland China; products with quality issues can be replaced free of charge within 15 calendar days from the receiving date in mainland China; within 1 year, products with malfunction caused by non-artificial reason will be repaired for free (only the stabilizer itself), however, will be charged for maintenance if its damaged by human behavior or force majeure (see details in maintenance service). NOTE: These Policies are available in mainland China, The Policies in other countries is subject to the regulations of the distributor or the store you bought. ⑴The product is checked upon delivery to have been damaged during transit (DOA) in the presence of the deliveryman and the buyer is able to prove it right away with clear images or certificate of damage provided by the logistics company. ⑵Obvious manufacturing defects (such as appearance defect) are found on the product without being used within 7 calendar days from the receiving date. ⑶The type or appearance of the product is found to be incorrect without being used within 7 calendar days from the receiving date. ⑷The product cannot properly function under the instruction or the guidance of the technician or is malfunctioning due to non-artificial reasons without being used within 7 calendar days of delivery. ⑸The product that is not compatible with the buyers’ smartphones or cameras ,which are not included in the official compatible list, and with no defect that will affect the second sales of the products can be returned within 7 calendar days of delivery (the packaging, accessories, complimentary, and instruction should be complete, with no man-made damage nor manufacturing defect). Under scenario 5, where the product has no manufacturing defect in its own structure or performance, the shipping fees of retuning products shall be borne by the buyers. Supplementary notice 1: The official stores of FeiyuTech (including T-mall and JD official stores) only provide after-sale service to the products sold on their own stores; for products sold on other channels, the after-sale policy is subject to the regulations of the distributor or the store where it was purchased. Supplementary notice 1: Buyers who return the products without communicating with the salesman first shall undertake the shipping fees (with no freight insurance provided) and be charged accordingly for maintenance if needed. ×The refund was requested beyond 7 calendars days of delivery (subject to the receiving note of the product). ×The packaging, the standard and complimentary accessories, and the instruction of the product are either incomplete or damaged. ×The main part or the accessories of product are damaged by human behavior (such as scratches) that will affect the second sales of the products. ×The product is damaged by human behavior, such as collision, leakage of foreign matters (such as seawater, sands and muds), burning down, unauthorized modification, incorrect installation, and malfunction caused by operating against the instruction. ×The label or machine code of the product is altered or obliterated. ×The buyer is unable to provide the invoice of purchase or receipts; or trying to forge or alter the receipts. ×The products is damaged by force majeure, including fire hazard, flood, lightning stroke, traffic accident and so on. 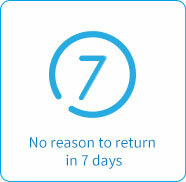 ×The buyer fails to return the products and relevant objects within 7 calendar days after the request is confirmed. Other circumstances mentioned in this policy. ★The product is checked upon delivery to have been damaged during transit (DOA) and the buyer is able to prove it with clear images or certificate of damage provided by logistics company within 15 calendar days of delivery. ★The type or appearance of the product is found to be incorrect within 15 calendar days of delivery. ★The product cannot properly function under the instruction or the guidance of the technician or is malfunctioning due to non-artificial reasons within 15 calendars days of delivery. ×The replacement was requested beyond 15 calendars days of delivery (subject to the receiving note of the product). ×The returned product does not match with the order information. ×Man-made damages (such as scratches) that will affect the second sales of the product are found on the main part or the accessories of product. ×No quality issue is found on the product itself after being thoroughly inspected by FeiyuTech’s after-sales department. ×The label or the machine code of the product is altered or obliterated. 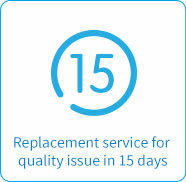 ×The buyer fails to return the products and relevant objects within 15 calendars days after the request is confirmed. ×Ask for replacing the product due to damage during the shipping, but the buyer is unable to prove it with clear images or certificate of damage provided by logistics company. From the date of selling, whenever the product is malfunctioning during the warranty period, you can apply for maintenance service on the official website of FeiyuTech or go to the after-sale service site nearby. (The warranty period of different products are slightly different, which shall subject to the standard pasted on FeiyuTech’s official website). 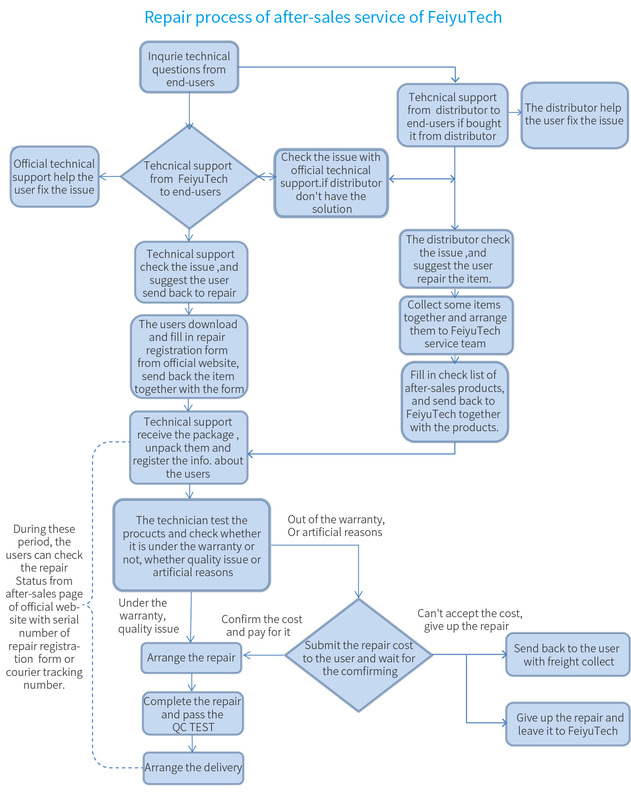 In order to provide better service and speed up the process, please fill in “Repair Registration Form” with detailed information of the issues and send it back to us along with the product. 1）Within one year from the date of selling, the product is malfunctioning under normal due to non-artificial reasons (all relevant accessories should be within the specified warranty period). 2）The malfunction of the product is not caused by artificial reasons such as unauthorized disassemble or conversion or addition. 3）The buyer is able to provide the certificate of maintenance service: the warranty card (with buyer’s information, date of selling and the code of the product), the legitimate receipts, invoices, or screenshot of purchasing. ◆The buyer is unable to provide legitimate receipt or invoices (such as brought at a low price) or the warranty card had already expired (subject to the date of selling on the warranty card). ◆The product has been overused, or operated against the instruction, or damaged by improper installation, assemble, storage, transit, or carrying. ◆The product is malfunctioning due to being used under environments that are not included in the intrusion (such as high-temperature and leakage of seawater and sands). ◆The product is malfunctioning due to improper storage or improper charging and discharging of the battery or using the batteries of other brands. ◆The product is malfunctioning due to the incompatibility of the third-party accessories that are not recommended by the FeiyuTech. ◆The product is damaged by misuse that exceeds its bearing limits. ◆The products is damage by force majeure, including fire hazard, flood, lightning stroke, traffic accident and so on. ◆The buyer shall return the product under the instruction of the technical staff; the high-price pick up charge or tariffs caused by incorrect claims of product’s value or name shall be borne by the buyer. ◆The product shall be returned at the buyer’s own expense, which will be collected and tested at FeiyuTech after-sales service center to confirm the liability. ◆If quality defects are found on the product itself, FeiyuTech shall undertake to pay the testing expenses, materials expenses, labor cost and the shipping fees of redelivery; (not including the customs duties charged according by laws of different countries). ◆If the product is not qualified for free maintenance (damaged by artificial reasons), FeiyuTech shall charge the buyers for the maintenance and transit (not including the customs duties) of relevant parts according to specific issues and take the initiative to contact the buyers to confirm the expenses. ◆If the product is not qualified for free maintenance, the buyers may choose to pay for the maintained or send it back unchanged; (all expenses, such as the transit fees and the customs duties, shall be borne by the buyer). ◆The non-waterproof product damaged by the leakage of water ,Or waterproof products with damaged by the leakage of seawater may end up being irreparable or being repaired at a very high price. Please use discretion when you applying for maintenance. ◆The firmware of the products and the Bluetooth will be upgraded to the lasted version and the device will be restored to the factory default settings. Please keep a backup of your personal settings (such as the motor power and the following speed) and write down the specific version of the firmware in the repair registration form before returning the product. ◆The financial loss created by incorrect address or rejection of the maintained products shall be borne by the buyer (including but not limited to the transit fees, the customs duties and the operation expenses). ◆If the maintained products is unable to be delivered or is rejected by the buyers, FeiyuTech shall undertake the storage of the product. All expenses of redelivery shall be borne by the buyers(including but not limited to the transit fees, the customs duties and the operation expenses); If the buyers fail to contact FeiyuTech within six month from the date of redelivery, the products shall be reclaimed by FeiyuTech.